The JayData ItemStore API is an ideal data library for most client data solutions, where information has to be stored on the client on a durable manner. For example persisting the cart in an E-Shop or recording unsaved form data to survive an unintentional F5 in the browser. No matter what the client capabilities are in terms of local data storage, JayData will find the best fit by probing for sqLite, indexedDb and HTML5 localStore. Or if you wanted to use cloud data instead of the client databases, with the help of the ItemStore API you can work with cloud hosted data endpoints as easily as you did it with local stores. 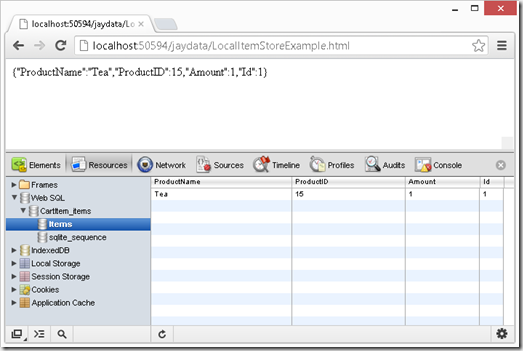 The JayData ItemStore API is a simplified API on the top of the JayData Entity classes to allow simple but common data management tasks to be done in even less code. While the JayData Entity API with its ORM approach is perfect for complex data models the ItemStore API in its design is closer to what most jQuery users are familiar with: a simple promise based fluent API and is a more convenient way to deal with simple data models. You will need jQuery and JayData for the following examples to work. The ItemStore API in the current release only provides typed data management: you have to define what fields you data object will have prior storing that kind of information. Untyped JSON object support will come in the following release. 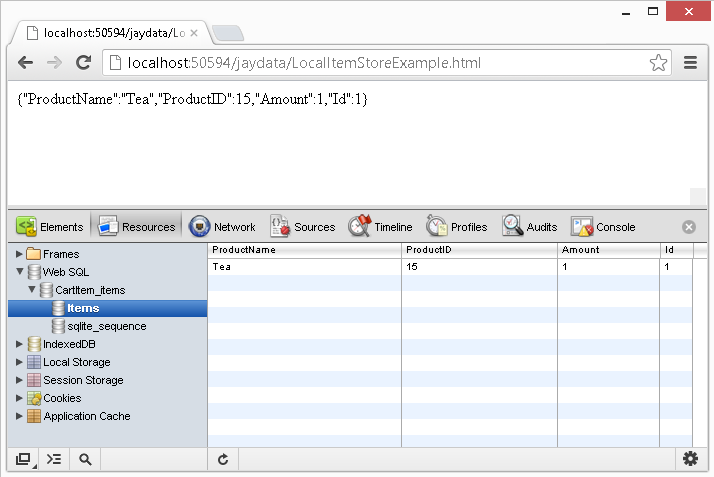 Use the $data or jayData global variables as the entry point to work with data. Calling $data.define is only required once per application run, best is on the application start. Subsequent calls redefine the CartItem type. $data(‘typeName’) provides the CartItem type that eventually provides a static API to work with. Use save() to create or update data. If you need a specific item from the set of items you need to know its unique identifier. Unique IDs are autogenerated if the model does not provide any key information. The removeAll method is convenient if you want to wipe out the entire collection without actually knowing what items will be removed.